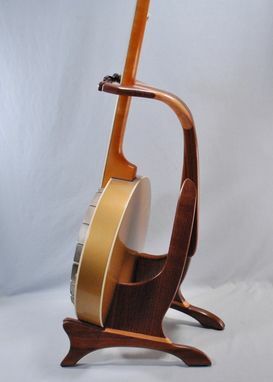 Walnut /Cherry banjo stand with neck latch, designed to hold either an open-back or resonator banjo. Clear lacquer finish and plush felt on all contact points. 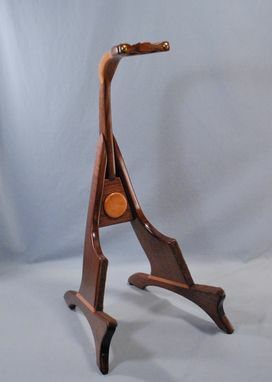 These stands are designed like the guitar stands, but with the neck yoke a little lower to accommodate the 5th string tuning peg. This is the fourth of four stands I have ordered from South Mountain. My two previous two banjo stands are from the same maker, and I just received this additional banjo stand and a guitar stand. I knew the design that worked for my banjos would make sense for a valuable classic guitar. Aside from the quality of workmanship and materials, the stands are aesthetically pleasing, protect the finish on my instruments, and work on shelves when I am not playing and as floor stands on which to rest instruments when I put them down during practice. I highly recommend South Mountain Woodworks. could not be happier...beautiful workmanship and very secure. Five stars for this entire project. The banjo stand is a work of art. I am beyond satisfied. I had looked online, among other sources, for ages seeking an exceptional Banjo stand for my Huber Banjo. I really love the looks and quality of this stand. 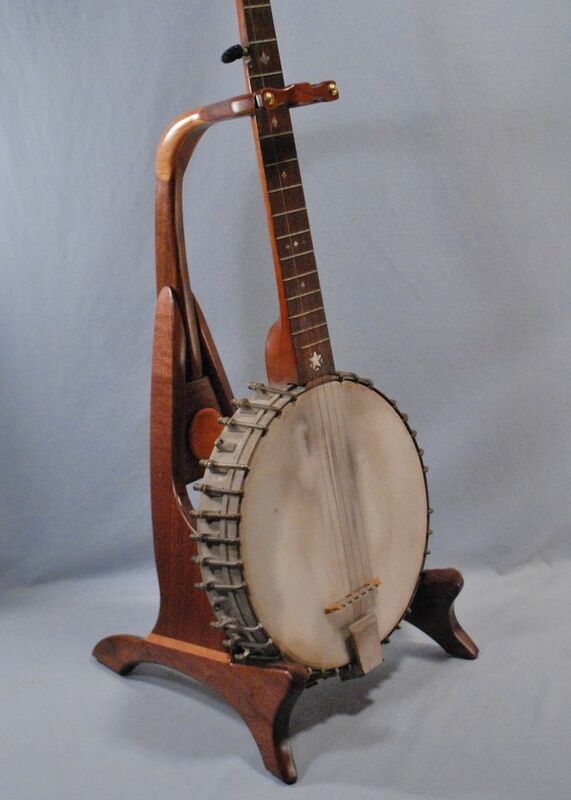 I am contemplating purchasing another banjo and if I do, I will definitely be purchasing an additional stand. The workmanship is artwork in itself.